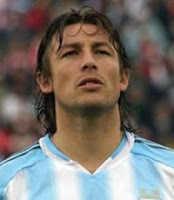 First off, Gabriel Heinze held showdown talks with Manchester United boss Alex Ferguson yesterday in a bid to resolve his future at the club. Almost all of the UK papers are reporting that Ferguson has told him a move to Liverpool is out of the question. Heinze has his heart set on a move to Anfield and The Daily Telegraph reports that the case will go to a Premier League Arbitration Panel meeting early next week. Real Madrid midfielder Emerson could be on his way to Inter Milan. Marca (Spanish link) report that talked have opened between the two sides, although Emerson's agent Gilmar Veloz has refused to confirm this is the case. Real Betis have all but completed the signing of Atletico Mineiro defender Lima. Marca (Spanish link) report that the 22 year old Brazilian will arrive in Seville today to complete a medical and sign a five year contract with the Primera Liga side. The transfer fee is thought to be 2.8million Euros. River Plate are involved in negotiations for two players. Ole (Spanish link) report that they will complete the signing of Nicolas Sanchez within the next couple of days, with Lanus midfielder Rodrigo Archubi also expected to join Los Millonarios on loan for the coming season. Finally, Fiorentina are set to make a 18million Euros offer for Atletico Madrid's Argentine midfielder Maxi Rodriguez, according to The Gazzetta Della Sport (Italian link).